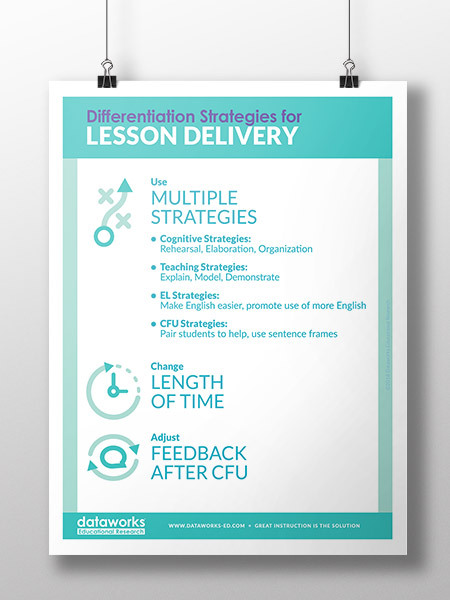 Explicit Direct Instruction (EDI), an interactive teaching strategy developed by Ybarra and Hollingsworth, involves the use of specific lesson delivery and lesson design components. The goal is for teachers to develop automaticity with the teaching strategies so they can focus more on how students learn and guide them more efficiently. When done well, students learn more and learn faster with EDI. One of the unseen qualities of EDI is that it turns teachers into supreme decision-makers, allowing for built-in differentiation for every lesson. 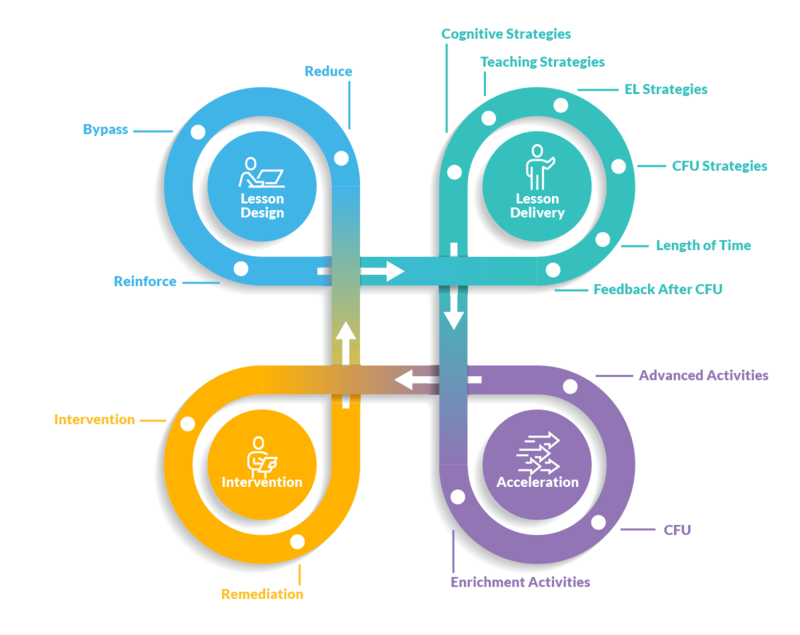 When the content has a solid framework with EDI Lesson Design, then the teachers can really focus on the delivery – on how students are interacting with the content. This focus on the students compels the teacher to face an array of choice points in every lesson where decisions must be made to enhance the learning process. 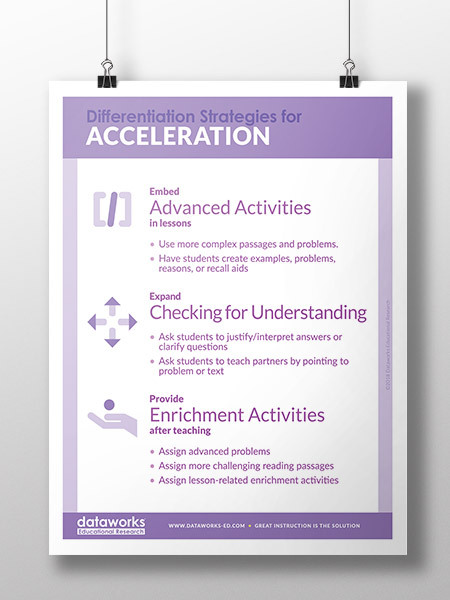 In this article, we will identify 14 choice points for differentiation that teachers can address within an EDI lesson. 1. Reduce the sub-skill difficulty. When teachers determine that their students are missing some skills needed for the lesson on grade level, then they can structure the lesson to reduce the difficulty. For ELA, teachers can use easier-to-read passages that still maintain complex ideas. For example, for a lesson on central message or theme for 3rd grade, teachers could choose a passage with a Lexile of 450 instead of 725, but still focused on identifying central message or theme. For math, teachers could simplify the arithmetic. For example, a problem could be 10% of $20 rather than 12.5% of $23. 2. Bypass the sub-skill difficulty. In designing the lesson, teachers could provide ways for students to do the lesson without facing the missing sub-skill. For an ELA lesson, they could provide a word bank or multiple choices for answers. For math, they could provide calculators or math facts tables. 3. Reinforce the sub-skill during the lesson. Another approach is to practice or reinforce the sub-skill during the lesson. Teachers can choose to review pronouns before sentences, for example, or times tables before 3-digit multiplication. They can teach the content of a passage before reading it. It can also help to teach the vocabulary of a lesson within the context of the lesson. 4. Use more Cognitive Strategies. To help students, teachers can add more rehearsal time in reading or pair-sharing. They can also give students opportunities to elaborate on their answers in a Checking for Understanding (CFU). Or, they can use graphic organizers to help students organize their thinking. 5. Use more Teaching Strategies. Teachers should consciously think about how they are explaining a concept. They should explain their thinking at how they would arrive at the answer. They could also model the language, the thinking process, and the detailed steps they would use. Or, they could use physical props to demonstrate a concept. 6. Use more EL Strategies. Ybarra and Hollingsworth have identified more than 50 strategies teachers can use to help English Learners. These are accommodations in making English easier to speak and ways to use English more during the lesson. These can range from enunciating more clearly to clarifying multiple meanings to using phonics rules. 7. Use more CFU Strategies. To help students more, teachers can pair up advanced students with those who need more help, especially for pair-shares. Another idea is to always use sentence frames for CFU answers. This gives students words to structure their answers. 8. Change the Length of Time. Another choice point for teachers is to change the length of time for different parts of a lesson. If students need more help or guidance, then the Concept Development or Skill Development sections can be lengthened by adding more examples, calling on more students, or even re-teaching. If students are quickly grasping a concept or skill, then the time can be shortened. There is no need to cover every example or problem if the students already get it. 9. Adjust Feedback after CFUs. Teachers have to choose how to give effective feedback. EDI offers seven strategies for doing that after CFUs. These range from providing cues and prompts to de-escalating to a multiple-choice answer to pair-sharing again. 10. Embed Advanced Activities in Lessons. If some of your students are more advanced or accelerated in general, or for this particular lesson, then teachers can add in some advanced activities during the lesson. For example, you could provide more complex problems or passages. These would challenge the students to dig deep and apply what they have learned so far. Another addition would be to have them create their own examples, problem, or reasons, or even recall aids to explain or elaborate on the skill. 11. Expand Checking for Understanding. There are two ways that teachers can choose to expand the CFU process for accelerated students. First, you can ask the students to justify or interpret their answers, or even to clarify the question. This gets them to speak more, use the language, and set an example for others. Second, you can ask students to teach their partners in a pair-share by pointing to a problem or textual evidence that will be the answer. 12. Provide Enrichment Activities after teaching. This is more for Independent Practice, but teachers can assign a range of advanced problems or more challenging reading passages for accelerated students. You can also assign lesson-related enrichment activities, such as short research projects, oral presentations, or a textual analysis or response. 13. 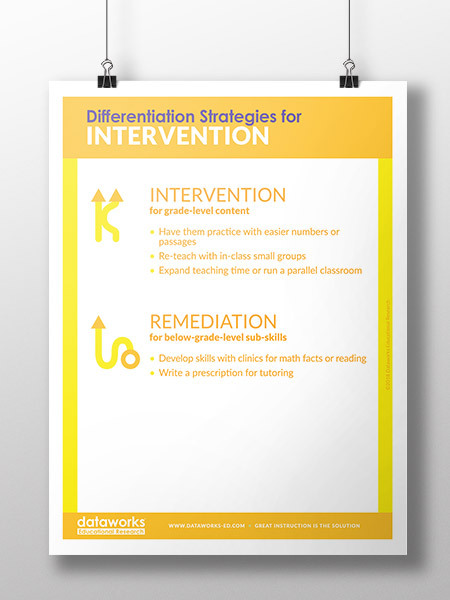 Intervention for grade-level content. For students who need extended help for some skills, teachers can choose three different options. 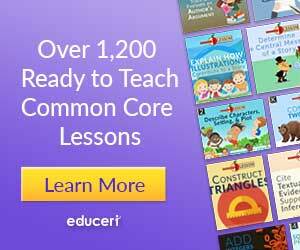 First, you can have students practice with easier numbers or passages. Second, you can re-teach with in-class small groups. Or third, you can expand teaching time or run a parallel classroom. 14. Remediation for below-grade-level sub-skills. In this case, you can develop the needed skills with clinics for math facts or reading that you can have the student participate in. You can also write a prescription for tutoring, if you have a tutoring operation available in the school or privately. The bottom line is that teachers have to become so proficient in delivering the lesson that they can focus carefully on student needs and choose to differentiate in useful ways. Often, the determination of need is seen during the Checking for Understanding, and then the teacher chooses what to do. But sometimes, it’s before the lesson starts or after. Teachers need to be decision-makers and choose to make a difference in the lives of their students. After all, that’s what the job is all about! Have you had any experiences with this kind of differentiation? Do you know of any other choice points during your lessons? 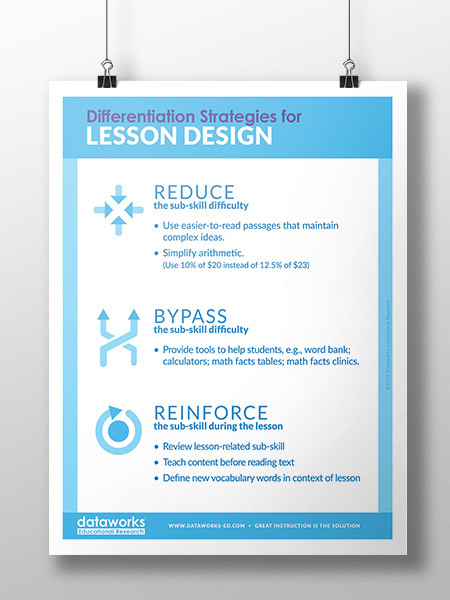 For more information, contact Dataworks Educational Research at www.dataworks-ed.com or 800-495-1550.